Sassing cats had humiliating results for Joey yesterday. Sauntering through the courtyard, he took a moment to jump into the planter and bark at Blackheart the Evil, sunning himself on a courtyard wall. Blackheart rose up on his paws and leaned over to glare at Joey. Kitty Cow the Curious crept around the jacuzzi. Blackheart walked down the wall, jumped onto the pavers beside Joey. With a lightening, one-two punch, Blackheart whipped his claws toward Joey’s flanks. Kitty Cow nosed up on the other side without drawing arms. Joey squealed like a piglet at a luau and jumped into Haleh Vera’s arms. Should have been the end of it, right? Cats 1; Dog 0. Vera sat down at the umbrella table to see how Joey was. Blackheart crouched under the chair, reached up over Vera’s thigh and tried to nail Joey again. She grabbed Joey and slammed out of the gate, down the sidewalk to the garage gate. Kitty Cow stepped elegantly through the bars of the courtyard gate. Blackheart stalked behind out of view. 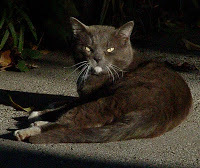 When Vera put Joey down again — we both believed that the cats had made their point and should be going back to their furtive hobbies — Blackheart leaped forward again, claws flashing. Joey hurled himself to the end of his leash and began racing in a circle to escape Blackheart and his diabolical colleague. Vera snatched Joey out of the reach of the Claws of Doom. We raced into the garage as the gate clanged behind, leaving Blackheart and Kitty Cow behind, gnashing their fangs. It was a humiliating day for Dogdom. My dog has a heart murmur. How serious is that?